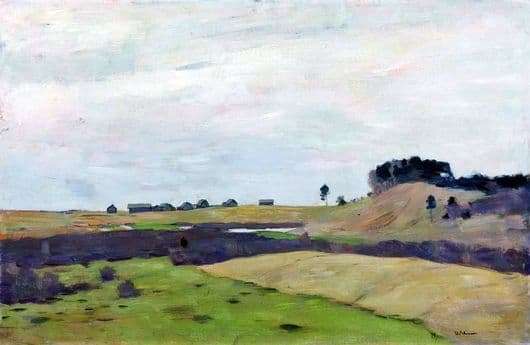 The picture of Levitan “Fields” shows the solemnity, majesty and simplicity of the beauty of Russian nature. There is calm and splendor here. Peasants’ houses are located in the distance and crowns of autumn trees are seen. Clouds are moving quietly across the sky, appearing over the horizon, as if emphasizing the infinity of the expanses. In his work Levitan brings pure nature closer to man, identifying them with each other. Her solemn spaces personify the day off in the village, when everything is quiet and peaceful around. The painting “Field” is a magnificent creation. The work is impressive, depicted on it is the mighty power of the Russian field. The canvas covers a large panoramic view. Spatial expansion is enhanced by clouds. The color shades of the paintings are very rich in colors. There are brown, yellow, green, blue and blue tones. Colorful paintings is the basis in the work of the artist. Landscapes of Levitan are considered a masterpiece of world culture. Depicting familiar landscapes, he put all the strength of his love for his native nature. It seems that the soul of the artist’s paintings lives in the beautiful music of nature. At first glance it seems that there is no definite compositional construction in the picture, but if you look closely, it is very well thought out and well-framed. From the edge of the field, the gaze slides inward, where small peasant houses can be seen. The picture is amazing with its realism. Studying the beauty of nature, Levitan masterfully transfers their image to the canvas. The work of Levitan is perceived by most critics as a mood conveying sadness. During his short life, the landscape painter has created a large number of world-famous works of art. The skill of the artist was recognized even by his contemporaries.